Madhouse's adaptation of BTOOOM! is a visually gifted, action-packed series that focuses on the dark side of humans. 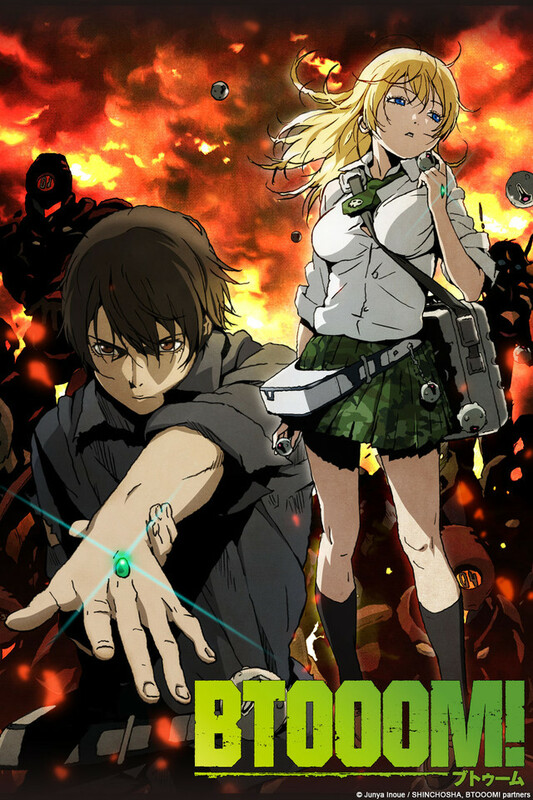 Madhouse Studios did a perfect adaptation of the BTOOOM! manga just like it was expected of them. They covered 50 out of 53 chapters that were released by the time the show ended. BTOOOM! provides action packed scenes, romance, drama, and virtual-worlds as well as adult oriented themes which some people might have trouble watching. This is by no means a series for kids, as blood and sexual themes are a given. Furthermore, the series has huge character development for most of the characters (specially the main two), while also having a unique cast of secondary ones. This series has amazing visuals and soundtracks; they are both typical top class Madhouse style, and they end up fitting perfectly with the series. Both the opening and ending sequences are well done, my favorite being the ending, which I believe provided great balance when the episodes ended in high note. BTOOOM! 's story is cruel, inspiring, emotional, real-life, but most importantly, very, very entertaining. The "final" episode was a great closure to this first season, as Madhouse gave hints of wanting to adapt a second season when enough manga material becomes available. Hopefully, it doesn't become another Deadman Wonderland (hope that one comes back soon!). In the meantime, you should not miss out on BTOOOM!, as it was one of the most entertaining series of Fall 2012. Of course, right at the end, I click "Yes". Great first season. This show had everything I could ever want. It's like LOST meets a bunch of crazy people with bombs. The better thing about anime is that they do not hold back on blood. There's a little bit of everything thrown in there for all; drama, romance, action, mystery...you name it, it's got it. Love the characters, love the storyline, and especially love animation. Still don't understand why this doesn't have more views or higher views. With Battle Royal/Hunger Games/and even Sword Art Online it really did a great job blending the genres and similar stories for a perfect anime. I watched the whole series in a day and don't have any regrets...I simply couldn't look away. I'm definitely looking for whats to come of BTOOOM!